A system set up by one nursing home to assist the transfer of its most vulnerable residents in case of an emergency had disastrous consequences for one patient when he arrived at hospital with the wrong medication details. Matters were made increasingly worse when the oversights with the so called “hospital passport” records were not immediately picked up and corrected by the hospitals charged with the care of patient, George Hunter. His family believes these failures led to a series of events which would result in a spiral of declining health for their already vulnerable relative. Despite immediately flagging up the issues around the incorrect information, the family would discoverer that the same system was still in place in the nursing home a year and a half after the original incident. When the health regulator did eventually investigate the matter after repeated approaches from the family, it found that the information prepared to accompany other vulnerable residents to hospital in an emergency, was still incorrect. We have spoken to the family of George, a former resident at Strangford Court, a private nursing home in Downpatrick. Inadequacies in the home’s system for keeping ‘up-to-date’ information on its residents’ medications records, had catastrophic effects when George was rushed to hospital with the wrong information. His family believes further failures by the hospitals in charge of George’s care to pick up on and correct the mistake triggered a sequence of events that would lead to a spiral of declining health for George over the following two-and-a-half years. They say he never fully recovered and in December 2011, George passed away just a few weeks short of his 60th birthday. Despite prolonged efforts to address the matter with the South Eastern Trust, the nursing home and the health regulator – George’s family would discover that the same system they believe failed their “wee man” in February 2009 was still in place a year-and-a-half after George’s life had been left hanging in the balance. The Regulation Quality and Improvement Authority (RQIA) was forced to act when George’s family approached one of the inspectors during an inspection of the home in July 2010. As a result the inspector placed an ‘immediate and ongoing’ requirement on the home which changed its practices on the day of the inspection after it was revealed that residents’ records were still incorrect. But for George and his family this development had come too late; the damage had been done. 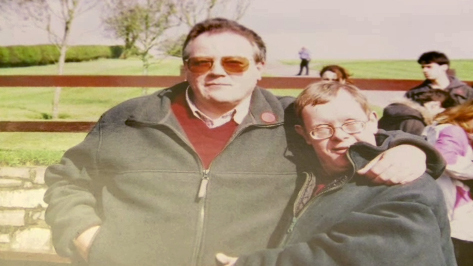 George had Down’s Syndrome and was a former Special Olympian. Before his mother died in 1982, she had arranged for George to be taken into full-time care. His sister, Rosaleen, and her husband Alan Ritchie ‘adopted’ George and he spent almost every weekend and holiday with them. George lived at home with Alan and Rosaleen between March 2004 and December 2007 when he had a stroke. The stroke affected George’s mobility, he could no longer walk unaided and required a wheelchair to get around. This and the onset on Parkinson’s Disease for Rosaleen made it impossible for George to return home and, after some time, a placement was arranged for him in the Oaklands suite of the nursing home in Downpatrick. Alan and Rosaleen continued to visit George at least two nights a week as well as Saturdays and Sundays. Over the years George and his brother- in- law Alan formed a close bond. Alan maintains that George’s rapid decline in health can be traced back to an incident in the nursing home: George had a fall, but the nursing home charged with his care failed to pass on the correct medication information when he was admitted to hospital. George’s fall in the nursing home on Friday 20th February 2009 evening set off a chain of events which Alan and Rosaleen firmly believe contributed to the deterioration in George’s health until his death in December 2011. George was initially transferred by ambulance to A&E at Downe hospital, accompanied by a member of staff and all the information attached to his ’hospital passport’ which was intended to contain details of current medications. Initial examinations showed no fractures and A&E was prepared to discharge George when Alan arrived. A second X-ray then indicated a hip fracture requiring urgent transfer to orthopaedics at the Ulster Hospital. George was admitted to the Ulster hospital at 5.00 am on Saturday morning. Alan went through the admission process on the ward at which point he saw the information with the ‘hospital passport’ for the first time and pointed out that it was incorrect as George’s anti-epileptic medicine – Lamictal – had been stroked out with a note ’dosage increased’, but the new dosage did not appear elsewhere. Alan said: “I stated very clearly to hospital staff that George was prescribed 125mg of Lamictal and I emphasised that my experience was that mornings seemed to be the time for minor events and in the circumstances given George’s agitation and lack of sleep there was clearly an increased risk. I even asked that the ward check with Oaklands”. When Alan and Rosaleen spoke to the orthopaedic surgeon in the Ulster that afternoon she confirmed that X-rays had indicted no sign of a hip fracture after all. A decision was made that George would be kept in overnight for observation and discharged on Sunday. When Alan phoned the ward on Sunday morning, staff told him that George was settled, but when he arrived it was a different story. Alan and his wife discovered that George had not been given the correct medication. Alan said: “George had not been given his anti-epileptics since admission. I then heard nurses talking in the background about not having Lamicatal on the ward and having difficulty getting it from other wards or pharmacy. I told the doctor that I had pointed out at 5.00am on the Saturday morning that the information which came with the hospital passport was wrong and had asked them to confirm medications with Oaklands. Alan and Rosaleen subsequently received a copy of ward notes dated 25 February 2009 indicating that Oaklands had phoned to say that they had realised they had sent the wrong details about George’s medications and apologising. By Monday morning on the 23rd February, Alan hand-delivered a written complaint to the hospital, emailed RQIA and posted a copy to Oaklands, highlighting the events of the weekend, with particular reference to the medications issue. For George, the nightmare was only beginning however. Over the next few days it became clear that George had contracted aspiration pneumonia, tested positive for MRSA and contracted a norovirus which was sweeping through the hospital at the time. George also developed a reaction to one of the drugs he was being treated with and his health continued to decline. For about six weeks George was very poorly and was treated in a side ward receiving only IV drips. Alan and Rosaleen visited a twice a day. George’s sister Rosaleen felt that the isolation in his own room was leading to disengagement and depression. George spent the next two months in hospital, losing 13% of his body weight. His ability to communicate, as well move and eat on his own deteriorated. After February 2009 George experienced increasingly frequent and severe seizures leading to recurring aspiration pneumonia, damage to his ability to swallow, reduction in his attention span, the ability to co-ordinate and communicate. We contacted Four Seasons Healthcare, the independent healthcare provider for Strangford Court Nursing Home. In a statement it said it extended deepest sympathies to Mr Hunter’s relatives and apologise sincerely for any failure on its part in his care. It said it had co-operated fully with the Trust and the RQIA in respect of the issues raised. A spokesperson said: "Our procedure for emergency admission to hospital details clearly the documentation to be sent with the patient including records of medication administration. Medicine Kardexes are attached to the transfer form. “The information provided on Mr Hunter’s admission to hospital included detail of his various conditions and specifically that he was epileptic and was prescribed Lamictal as treatment. “The Medicine Kardex that accompanied him to hospital included that his dosage had been increased but the most recent dosage information was not made available to clinical staff at the Royal Ulster Hospital and this was due to human error, which we notified to the hospital and for which we have apologised. In an RQIA inspection report obtained by The Detail from August 2008, it outlines how the then manager had recently introduced a new scheme in the home called the “hospital passport” – a document produced by the staff of all the relevant information required on each patient in the suite to enable them to “communicate their needs effectively when moved from the home to an acute situation outside the home”. Four Season’s healthcare says that while there was an error in transferring the correct information to the medical Kardex in George’s case, this information is not part of the the passport system, although it is photocopied and attached to the transfer notes. They claim that while the hospital passport system was intended to provide helpful information, it was not a substitute for clinical diagnosis and should not have stipulated what medication was prescribed. Alan said: "Trying to hide behind definitions of what does and doesn’t fall into the category of the the passport system in my opinion is inexcusable, at the end of the day the incorrect information was sent as part of the transfer document and it was attached to it. Despite the issue being flagged up by Alan, an RQIA inspection from July 2009, just five months after George’s fall, contains no reference to the passport system or its potential oversights. In a statement a spokesperson for RQIA said: "In 2008, RQIA commended Strangford Lodge for its ‘hospital passport’ scheme. This was a document with relevant information on each patient to enable them to communicate their needs effectively when moved to an acute setting outside the home, which it had recently introduced. However, any such system is reliant on accurately recording relevant information. “Following the receipt of an email from Mr Ritchie on 23 February 2009, RQIA advised that, in line with complaints guidance at the time, in the first instance he should raise his complaint with the home for local resolution. RQIA also advised that it would follow up the issues raised through its inspection processes. The Detail is aware that another inspection took place with a report produced in July 2010. It made reference to the “hospital passport” system again – a clear indication that the system was still in place. Alan had been present in the home while this inspection was taking place and he approached the inspector to raise his concerns about whether the system had been corrected or not. As as result of his intervention, the RQIA inspector looked into the issue, discovered that it had not been corrected and placed “an immediate and ongoing requirement” on Oaklands which led to the “hospital passport” scheme being discontinued. Alan said: “In my email to RQIA just days after George’s fall , I identified what had happened was potentially life-threatening, and specifically asked RQIA to take immediate steps to review the accuracy and the presentation standards of such information given the consequences for George. George’s case is currently with the Northern Ireland Ombudsman. The South Eastern trust say that all the issues raised by George’s family have been “pro actively and thoroughly investigated” and that as the Ombudsman is currently reviewing the trust’s management of the complaints made by family members – it would not be appropriate to make any further comment. However, Alan and Rosaleen say they are determined to pursue the matter until they are satisfied that all issues around George’s illness have been addressed to their satisfaction. Alan said: “We hold the firm view that what happened in February 2009 contributed to George’s demise. It certainly contributed mightily to the distress and suffering he experienced between then and December 2012 when he died. “Talking about this is hard, even nine months after his death the pain is still raw. We both miss our wee man everyday. George was an innocent victim, there could hardly have been a more innocent victim.